3. Smart power saving mode: RK61 will turn into sleep mode if no operation on keyboard for 3 minute. 4. Smart wake up mode: You can press any keys to wake up RK61. 6. Good service: We provides 12 months warranty and 30 days no reason return. 1.If you found Bluetooth disconnects periodically, the keyboard may be in low power, please go ahead to charge the keyboard. 2. To improve the using experience of RK61 keyboard, we have upgraded the power saving mode from 1 minute to 3 minutes. FN+ arrow keys is replace by using arrow keys directly. Besides, the issue of Bluetooth can not be recognized was solved in the upgraded version. If you found your RK61 is in the old version, you can contact us via E-mail to exchange a new one. 3. RK61 keyboard is a blue switch mechanical keyboard with an audible "click" sound, if you prefer to type quietly, RK61 is not recommend. ▼ Multi-device and dual connectivity: RK61 is an universal mechanical keyboard with 61 keys for typing on all your Bluetooth-enabled computers or mobile devices that support external keyboards with HID profile, such as laptop, computer, tablet, smartphone. RK 61 is also with USB connectivity. Besides, RK61 can connect up to three devices simultaneously and can switch among them easily by clicking the button of FN+Q, FN+W or FN+E. 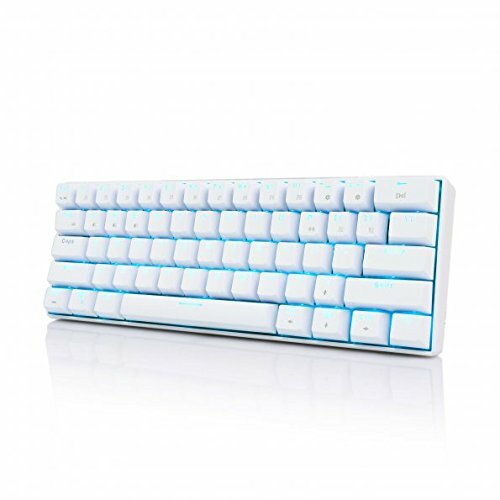 ▼ Mechanical keyboard with blue switches: Mechanical Keyboard Blue switches with endurance up to 50M key presses, is ten times longer than membrane keyboards, which leads to tactile and clicky with a bump feel. ▼ Concise and portable: Designed with ultra-thin, light weight, small size and concise outlook, RK61 keyboard is handy, comfortable and portable to carry to everywhere for familiar typing in any room. ▼ Built-in rechargeable battery : Users get pleasure from up to 10 hours of writing time with only one charge. RK61 bluetooth keyboard has a rechargeable lithium-ion battery. Standby time is up to 360 hours. If it is power off, you can change into USB mode. ▼ Bright LED backlit: RK61 has clear and bright backlighting effect with 2 adjustable brightness level making typing that much more enjoyable and awesome to look at. Backlit will automatically turn off when idle more than 3 minutes to conserve power for when it is most needed. If you have any questions about this product by RK ROYAL KLUDGE, contact us by completing and submitting the form below. If you are looking for a specif part number, please include it with your message.